Ani-Gamers staff writer Ink contributes a weekly column in which he examines the differences between the original Fullmetal Alchemist and its re-telling, Fullmetal Alchemist: Brotherhood. To read previous entries, click here. 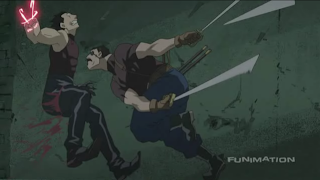 While FMA2 may attempt to lure us into a false sense of familiarity by resuming where it left off, underground in The Devil’s Nest, there’s a lot more sucker-punch behind door number one. Let’s start with a humorous scene involving Al’s resistance to Martel and, separately, Fuhrer King Bradley’s appearance at the Devil’s nest (noticeably all decked-out with 6 blades. Yeah, 6 blades!!!) with a task force from Southern HQ. We can continue with a speedy and vicious fight between Bradley and Greed paralleling a more humorous and darker one between Armstrong and Roa. While the latter isn’t necessarily a departure from FMA1, its theme is. There’s a wonderfully dark moment when, seeing soldiers behind Armstrong (who doesn’t know that they’re there), Roa basically accuses Armstrong of maliciously cutting down a former comrade of the Ishbalan conflict (himself). After this is a great rescue scene, wherein Dolcetto slashes through the aforementioned troops. Martel’s and Al’s wait in the woods near Dante’s of FMA1 is replaced with their waiting in a sewer while Greed gets diced-up by Bradley, who makes his ultimate self known way earlier and in a much more direct manner than in FMA1. Though, this is still spurred on by Dolcetto’s and Roa’s wish to defend Martel from further harm by staving off the military force (solely embodied by Bradley). There is more fast and furious fighting as Bradley and a regenerated Ultimate Shield go at it like two jealous lovers, which results in Greed’s henchmen being cut apart before his eyes. His henchmen bought the proverbial farm in FMA1 as well, but Greed seemed more human there. Come to think of it, so did Lust and Gluttony, who were responsible for hunting down greed in FMA1. In a major departure from FMA1, instead of Martel being a passive victim of Bradley’s, she takes control of Al’s arm to strangle him. This results in the same method of death, but with a great difference involving Al’s blood seal and the return of his memories (or at least a trip through certain chain of events). When Al comes to, Ed is trying to snap him out of his daze and Martel has been ripped out from inside of him. After a harsh interrogation of Ed about his relationship with Greed, Bradley sits bedside with Izumi and, tongue-in-cheek, offers her a State Alchemist position. On an animation note, it strikes me that Izumi’s lines are more rounded, less harsh, which suits this FMA2 character well but would have been totally unacceptable in FMA1. Something that doesn’t happen until way later in FMA1: homunculi reunion!!! FMA2 jumps right on in and has Envy, Lust, Gluttony, and Wrath (played by Bradley instead of FMA1’s island-boy/Izumi-stillborn) meeting together to discuss Wrath’s evaluation of Ed and Izumi as well as to discuss his recent capture of Greed. Just before “Father” melts Greed down into homuncul-wine (thank you), Sloth is revealed as toiling away in a tunnel and most definitely not in the form FMA1 viewers know and heartbreak over. Oh, and “Father?” I’ll give you a hint. Though bleached out by bright light, the animators make sure viewers know he has a full beard, rather pointy in parts, and wears glasses. Next week, it looks like we’re finally spending some time with Scar and on the Ishbalan back-story, which, story-wise, is still in line with FMA1.